Written by Travel Excellence Once again the most important local athlete, Nery Brenes, put the Costa Rica map over the rest of the world thanks to his speed and excellent condition. In a very unforgettable performance, Brenes, the highest Costa Rica attractions as individual sportsman, won the gold medal in the 400 meters race at the 2011 Pan-American games in Guadalajara, México. 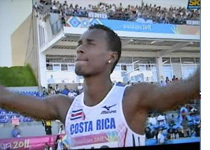 The famous sprinter from Limón, an important Costa Rica culture zone on the Caribbean, won the first medal for his country in these games, and the first medal won by a Costa Rican in any Pan-American games since 2003. Some minutes before the race started many experts said the “Tico” should be the logical winner in this competition, as finally was confirmed. A few hours later, fellow Costa Rican Sharon Scott had a good chance to win another medal in the 400 meter women’s final, but placed fourth and hope ends in less than a minute. Previously, in the qualifying rounds, Walter Salazar, the Brenes´s trainer had planned a conservative but effective strategy leading some to doubt whether or not the Costa Rican would win the gold medal. Salazar despites the fact that Brenes had performed very well at international meets during the season and was considered a favorite in this race before the games. Brenes ran in lane 1 for the final, because he qualified 3rd in the previous round and, as a part of his trainer plan, he started out with a seeming disadvantage on the inside lane, but it was just to conserve his energy during the first part of the race. At the midpoint of his performance he turned on the jets to take the lead and finally cross the finish line in the first place. The Costa Rican athlete won with a time of 44:65 seconds. Luguelin Santos of the Dominican Republic with 44:71 was second and Ramon Miller of the Bahamas placed third with 45:01. Family vacations in Costa Rica? We help you to plan them now! Let’s disguise in a Masquerade Parade!